5つ星のうち5.0A hilarious and insightful look at the English language--mostly it has aged well. 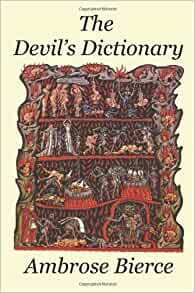 For decades I have read and been amused by the cynical definitions from Bierce's "The Devil's Dictionary." Finally I decided to get a copy. Though much of it is outdated from the 1800s, there were more than enough gems to be worth purchasing it. Things like: "Peace, n. In international affairs, a period of cheating between two periods of fighting." "Politics, n. A strife of interests masquerading as a conflict of principles. The conduct of public affairs for private advantage." And, "In our civilization, and under our republican form of government, Bain is so highly regarded that it is exempted from the cares of (public) office." There are numerous small poems illustrating his definitions by poets I never heard of leading me to suspect they were written by Bierce himself, as doubtless were the many fanciful anecdotes. Well worth a writer's time. While some of the entries are badly dated, others remain as true as the day they were written by the brilliantly cynical Bierce. Idiot -- A member of a large and powerful tribe whose influence in human affairs has always been dominant and controlling. The Idiot's activity is not confined to any special field of thought or action, but "pervades and regulates the whole." He has the last word in everything; his decision is unappealable. He sets the fashions and opinion of taste, dictates the limitations of speech and circumscribes conduct with a dead-line. Required reading for anyone with a sense of humor. 5つ星のうち5.0Great. And Terrible. Biut it's a MUST READ book that enhances everything else you read. Ambrose Bierce didn't write this dictionary. Instead, his definitions were filler for newspapers, later collected and published aw a dictionary. That's an importabt distinction, for he made no effort to write a complete dictionary, and he was writing in the context of current events that are no longer current. He includes a lot of poetry written by poets I've never heard of. Sometimes, it's more interesting than other times, and i wonder if that's because this was authored more than a century ago. The fact that so many definitions are still current and amusing gives us a perspective on history - the fact that human nature hasn't changed, that politicians and preachers and businessmen were pretty much the same then as now. Is it fair to critique a book for how masterfully it enhances our understanding of human nature, even though that wasn't the author's avowed purpose? This book can be incredibly boring at times, and brilliant at other times. If i were teaching college freshmen, though, I'd make this book required reading.